ApinSoft PDF to Image Converter is an application that help you quickly convert PDF files to common image formats files. (such as JPEG, JPG, PNG, GIF, BMP, EMF, EMF+, TIF and TIFF file) . 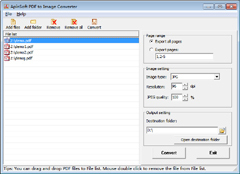 ApinSoft PDF to Image Converter support: PDF to JPG, PDF to PNG , PDF to GIF , PDF to BMP, PDF to EMF , PDF to TIFF at one time. Running ApinSoft PDF to Image Converter does not require any Adobe Acrobat programs or Image Processing programs installed on your computer. ApinSoft PDF to Image Converter can do conversion very fastly, and the image quality is very high. 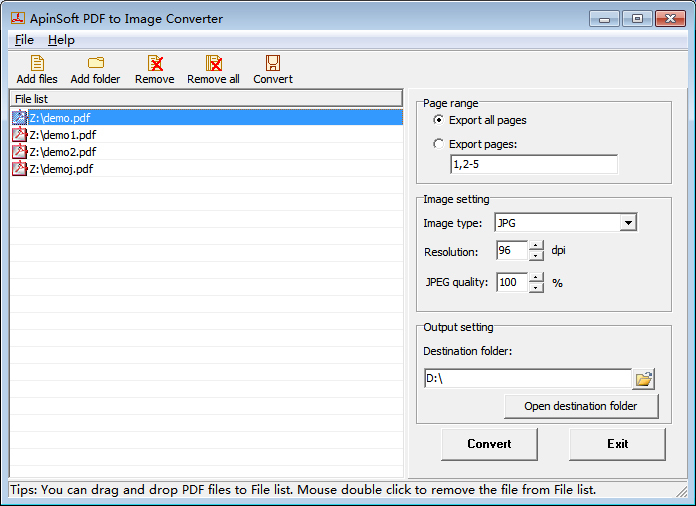 ApinSoft JPDF to Image Converter is easily used, you should only do some simple steps to do the conversion.